The tour starts in Camogli on the west side of the Portofino promontory, a former fishing village (known in medieval times as the ‘city of a thousand sails’) which was described by Charles Dickens as ‘the feistiest, roughest, most piratical little place I’ve visited’. It’s a little more couth these days but has lost none of its nautical charm. The first walk of the tour takes you through the national park that separates Camogli and Portofino following a series of well-marked trails through pine and oak forests above spectacular coastline with some of the most beautiful views in northern Italy. Leaving the Portofino peninsula on Day 3 you pick up the ancient pilgrim trails that connected France wth Rome, passing through the hills that wrap around behind the Gulf of Tugullio, dropping down to the lively coastal towns each evening. The tour finishes at the end of the gulf at the ‘Bay of Silence’ in Sestri Levante, a delightful summer resort on the Isola Peninsula. This a Grade 3 walk. Starting with a walks through the Portofino National Park, this walk picks up the pilgrim trails that ran above the Liguria coast, climbing up into the forested hills each day before dipping down to the bustling coastal towns in the evening. The trails follow a combination of ancient paved paths and well-marked walking trails. 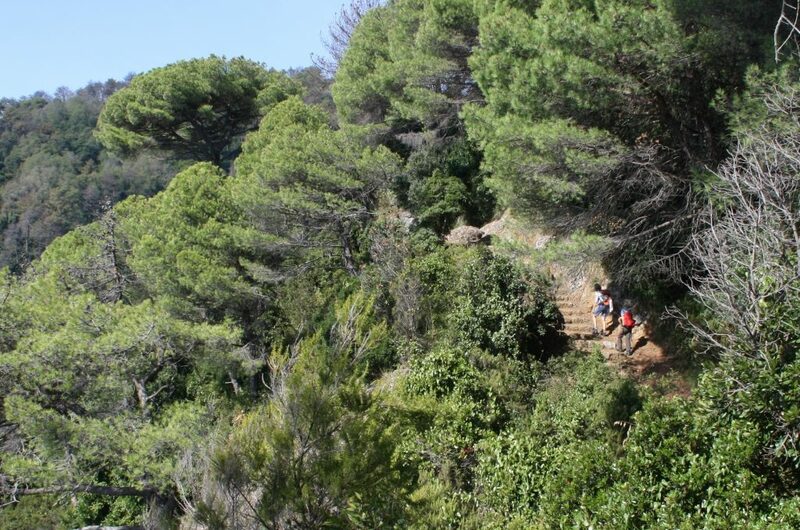 There are some steep climbs and both the last two days walks are over 15 kms, however, in both cases it is possible to break the walks half way along the route and take a local train to the end of the walk. You’ll be staying in a combination of very good, centrally located three and four star hotels, in comfortable rooms with generous breakfasts, en suite bathrooms and sea views. Ligurians like to use their own trusted products which come from the 350 kilometres of coastline with its rough, mountainous hinterland or which is fished out of theIr own waters. It is an austere but delicious style of cooking that has produced such specialties as pesto sauce and foccaccia. Even the wines, grown with great effort on the steep, rocky terraces suit the local food perfectly. Arrive in Camogli on the main La Spezia/Genoa railway line, where you’ll spend your first night in a lovely four star hotel set in a restored noble residence in the centre of the town. Today you leave Portofino and take a lovely path that winds above the coast passing through olive groves with views over bays and hidden villas to Santa Margherita Ligure and then on to a neighboring busy port, picking up the pilgrim trail and entering the town over a Roman bridge that Hannibal and his elephants reputedly crossed….. your accommodation is an excellent 4-star hotel on the waterfront. (11 kms, 3.5 hrs). The last walk takes you along the sea front to the neighbouring town before picking up the pilgrim trail again, climbing up into the hills and following the old paved trail until you come and a ruined church with breathtaking views down over Sestri Levante and the Bay of Silences, your last destination. Your accommodation is lovely overlooking the bay a fitting finale to your walk. (15 kms, 4.5 hrs).